For small retailers based online, each order you fill and each package you send is a great opportunity to create a memorable moment with your customers, build a fanbase, and inspire shopping in the future. Taylor Combs, staff editor at Etsy, shares her branded packaging tips and advice from an expert Etsy shop owner to help you do more business this holiday season and all year long. Slipping a branded postcard, handwritten thank-you note, or colorful flyer into the package when you ship your online orders creates an opportunity to personally connect with your customers and give them a more memorable experience. "A memorable branded experience makes it easier for customers to recall the people they have ordered from in the past," says Etsy shop owner Sarah Neuburger of illustrated stamp shop The Small Object. "Even if they don’t remember your name, it can help them recall the look and feel of their order, and encourage them to return." Think like a shopper and show your personal side. Including business cards and additional materials spotlighting other products in your packages gives your buyers more opportunities to connect with you and share your brand with their friends. Think about what you’ve enjoyed receiving as a customer—and incorporate those elements into your own supplies. What made you feel special and excited when you opened a package? In addition, a handwritten note or post card in your package is a great way to let shoppers know that there’s a real person behind your online business. If you receive an order from someone in your community, let them know that your business is local. You can connect with any shopper by sharing a personal anecdote about what inspired you to make the item or a note about why you think it makes a perfect gift. 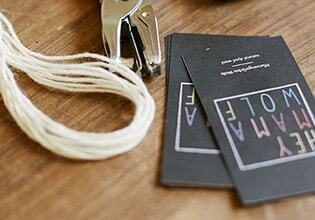 In orders from The Small Object, Sarah includes a business card and a small reusable item. "I recently created a ‘You’re Awesome’ note that mentions my name, which buyers can pass on to a friend or coworker," says Sarah. She also includes a printed note explaining the origins of her business to help build a relationship between her and her customers. Show off your creative side using textures and colors in your packaging that reflect your unique brand. Chris Campbell sells handmade paper lanterns in his Etsy Shop, The Society of National Industry. He uses colorful recycled paper scraps and twigs of red cedar to give their packages a natural touch and create an aesthetic unique to the brand. 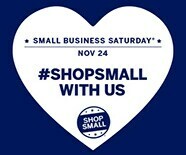 Small Business Saturday® (celebrated every year on the Saturday after Thanksgiving) is a great way for small business owners to kick off the holiday shopping season. You can visit the Shop Small Studio at ShopSmall.com/Etsy to download customizable Shop Small marketing materials, compliments of American Express. You can even request Shop Small merchandise to help promote your online-based business (while supplies last) and let shoppers know they can feel good about supporting a small businesses like yours any time of year. Including your social media handles on your in-package inserts and encouraging customers to follow your business on social media gives you another opportunity to connect and reveal a little bit more of your personality. You can use the social media templates available in the Shop Small Studio to create a cohesive experience for shoppers during the busy holiday shopping tradition surrounding Small Business Saturday. Inspired to start your own Etsy business? Share your passion with the world. Gain access to millions of potential customers. Start selling today. Learn how to open an Etsy shop.